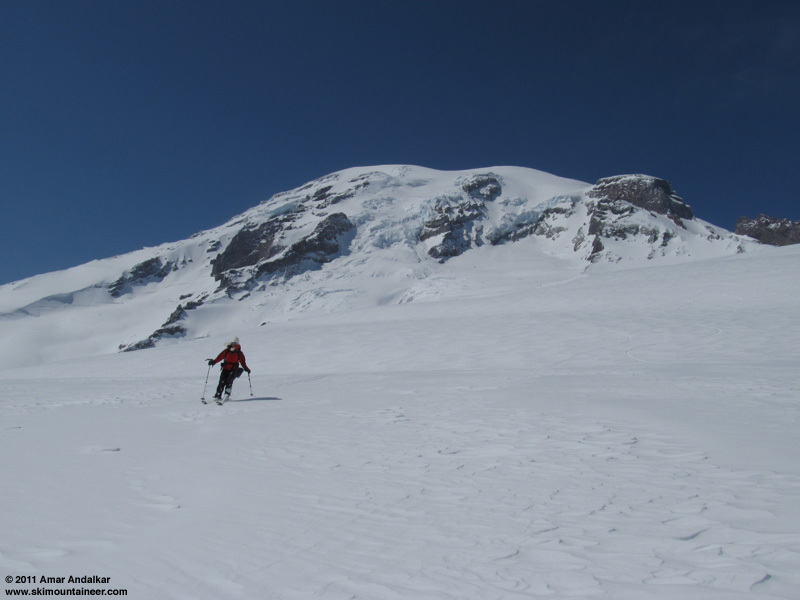 Lots of times skiing from Camp Muir for me in mid-April, what would turn out to be 5 times in 15 days (including 3 times in a 4-day period). It was great to get back up to high elevations in bright sunshine after not going up there for nearly 2 months due to ongoing stormy weather. 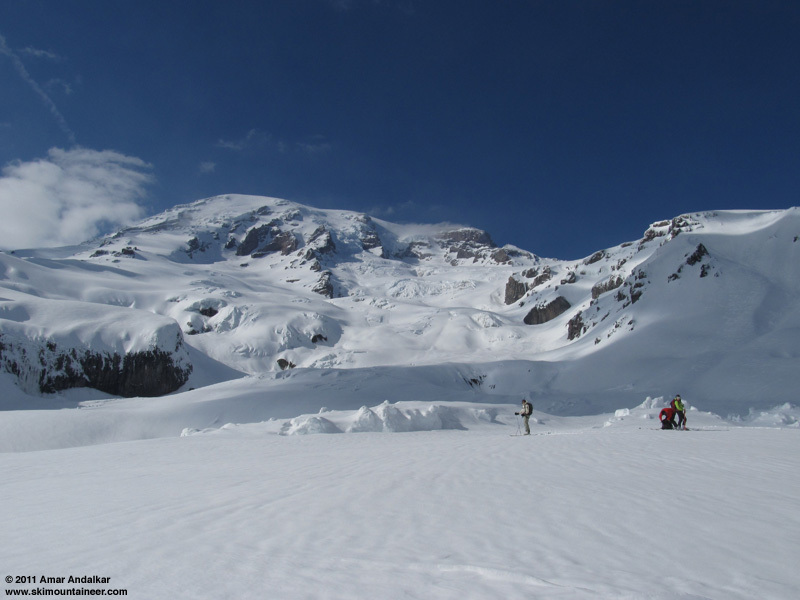 April 8, 2011, Mt Rainier, Muir, Almost Shutdown? Circumstances prevented writing TRs promptly for the other 3 trips, but I wanted to go back and write something now. Another solo trip on Wednesday, April 20, under partly sunny skies in a brief morning weather window before the next storm rolled in. But this time in hideous snow conditions: no powder left, all breakable trap crust. Not really skiable, except by long traverses linked by cautious turns. Better snow above 9500 ft (solid supportive frozen crust) and below 6400 ft (inch of softened snow atop firm supportive crust, decent turns), but the middle 3000 vert was nasty conditions, definitely in the bottom 5-10% out of my 100+ Muir descents (just above the few late-summer trips on solid blue glacial ice studded with rocks). 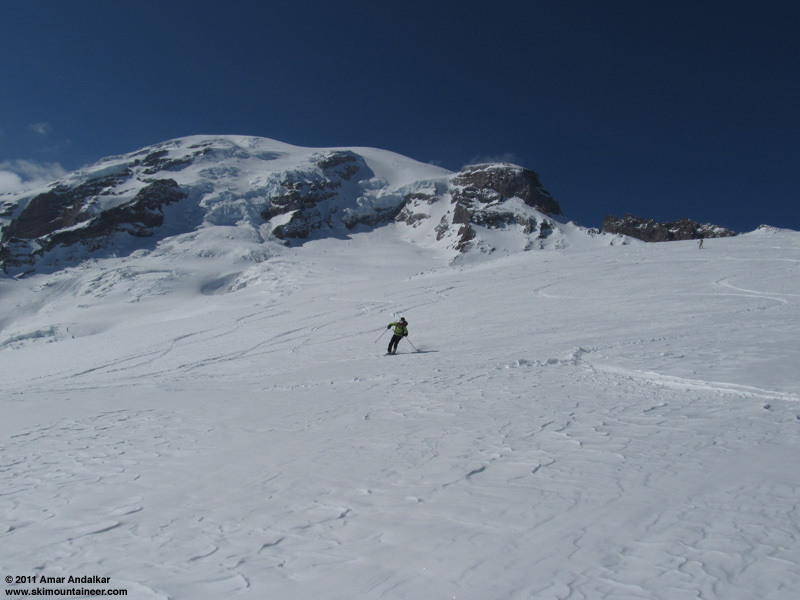 It took a full hour to ski from Camp Muir down to Paradise under those conditions. Even worse, much worse, I arrived home from that trip to find an email from Sky linking to a news story, that my close friend Dave Pinegar had died two days earlier on April 18 in a rappelling accident in Joshua Tree National Park. Spent many hours that evening and much of the next day on the phone with other friends and family of Dave's, trying to understand what had happened. Dave had just written his first TR on TAY a week earlier (after lurking for many years), and now he was gone, dead only a few weeks after his 33rd birthday. 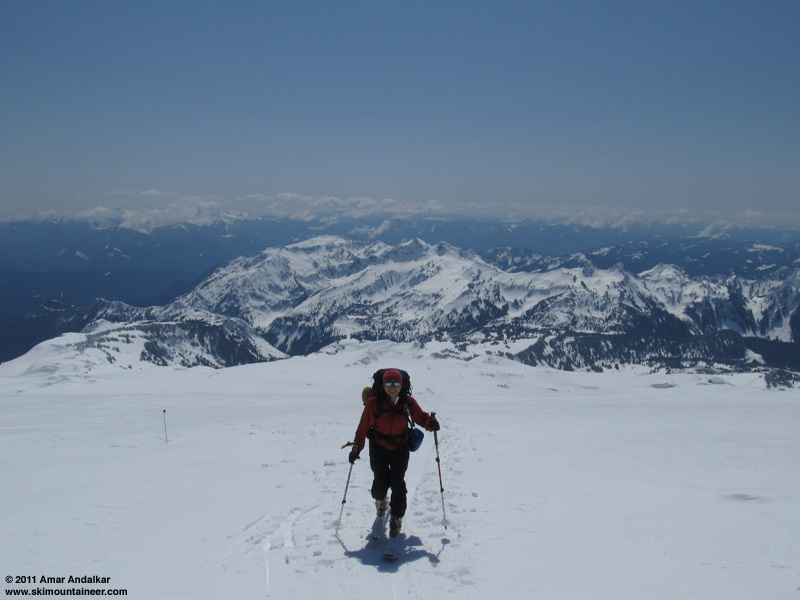 Plans that we were making for spring ski trips together, in the Sierra, on Mount Shasta, and in the Washington Cascades, all of which now would never happen. But the forecast for Friday and Saturday looked stellar, sunny and warmer, followed by a return to many more days of clouds and rain. I knew that it wouldn't be healthy to stay home on sunny days and mope about a second close friend dying in 2011, both far too young and far too good. But where to go, what to ski, what to do? I had no plans whatsoever, and I wasn't sure if I really even wanted to ski anywhere alone right now. 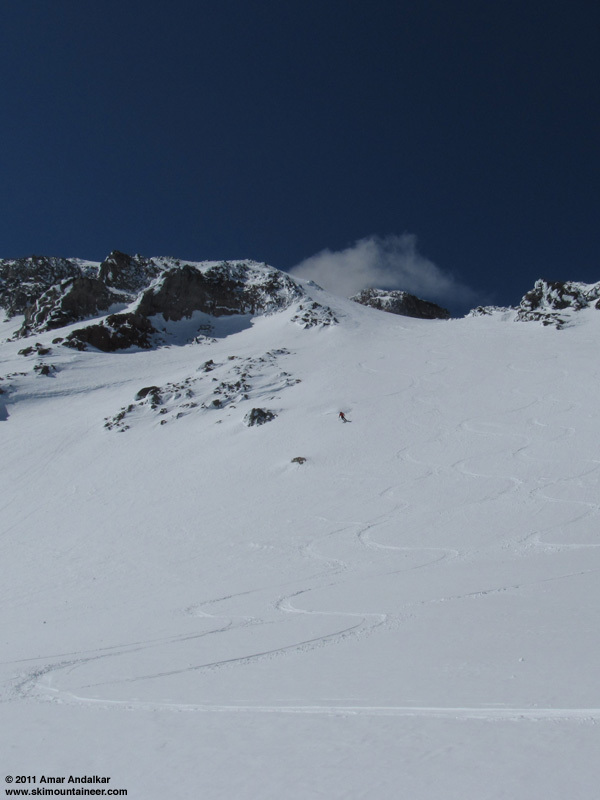 But then a call from Khanh on Thursday evening suggested back-to-back trips to Muir to fill the two sunny days, as she hadn't skied up there since last year. Just the two of us on the first day, then joined by several other friends on Saturday. Despite the horrendous ski conditions on Wednesday, another 9" of new snow had fallen since then, so hopefully the breakable crust would have solidified by now and be well covered with fresh smooth snow. It sounded like a fine plan to me. We skinned up from Paradise around 10:30am on Friday, a cool morning despite the brilliant sunshine. 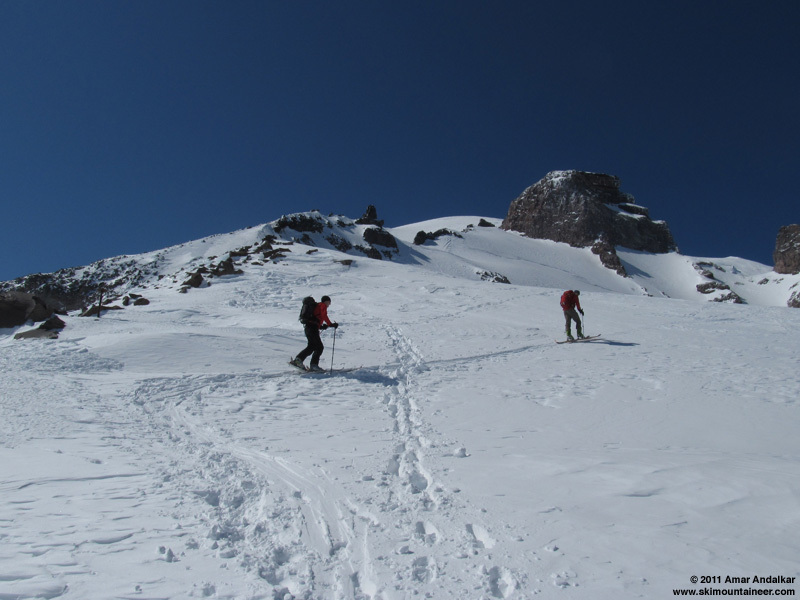 Above Pan Point, a brisk easterly breeze made things quite chilly, rapidly drifting the previous night's new snow into the skin track, so it seemed like constant trail-breaking at times. 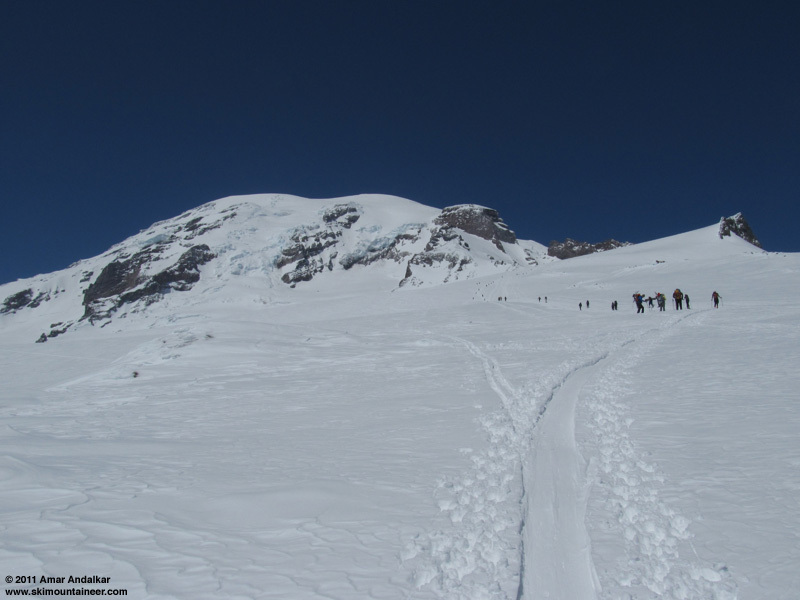 Despite the wind and drifting snow, we made good time and reached Camp Muir by 1:45pm. Hung out there for a while in the sunshine but with very chilly conditions, temps near 15 �F and a SE breeze of 15-20 mph, it was essential to find a nice sunny spot protected from the wind. Skied down at 2:30pm on smooth dense powder, a very nice ski surface, and mostly deep enough to stay off the frozen crust below the new snow. We decided to ski down to the Nisqually Bridge, gaining an extra 1500 vert of skiing at the cost of needing to hitch a ride. 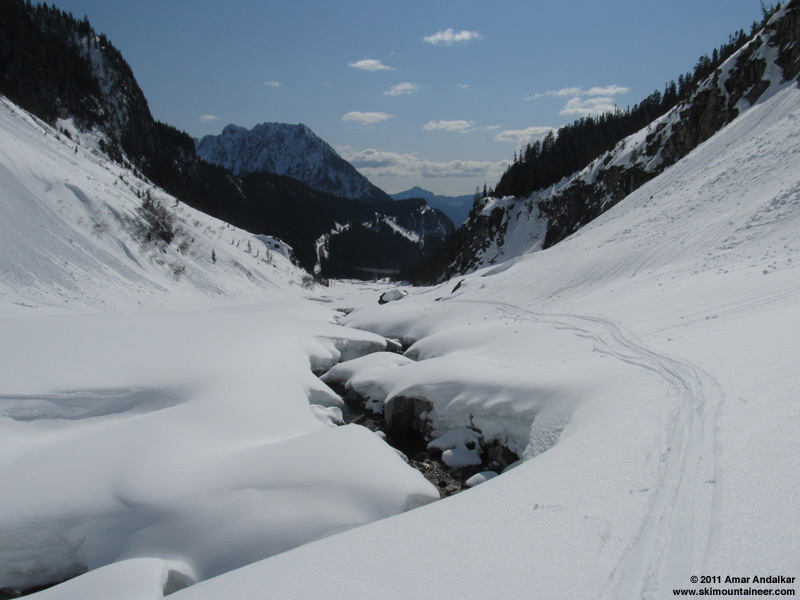 After taking a quick look down Nisqually Chute (very wind-affected and unappealing, with no tracks yet), we headed for the much safer route down to the Nisqually Glacier via Pebble Creek. Just as we were approaching the west-facing gullies below Pebble Creek, a party of three skiers approached from an unusual direction, along the westernmost edge of the Muir Snowfield, and after I asked where they had skied, one of them recognized me and they eventually admitted to having "skied something crazy": Nisqually Ice Cliff, a probable first ski descent by the three RMI guides. We told them we were planning to ski to the bridge, and after a quick chat, they took off down the slope ahead of us. The 35-degree slope skied nicely, a bit crusty in spots, but mostly smooth proto-corn otherwise. 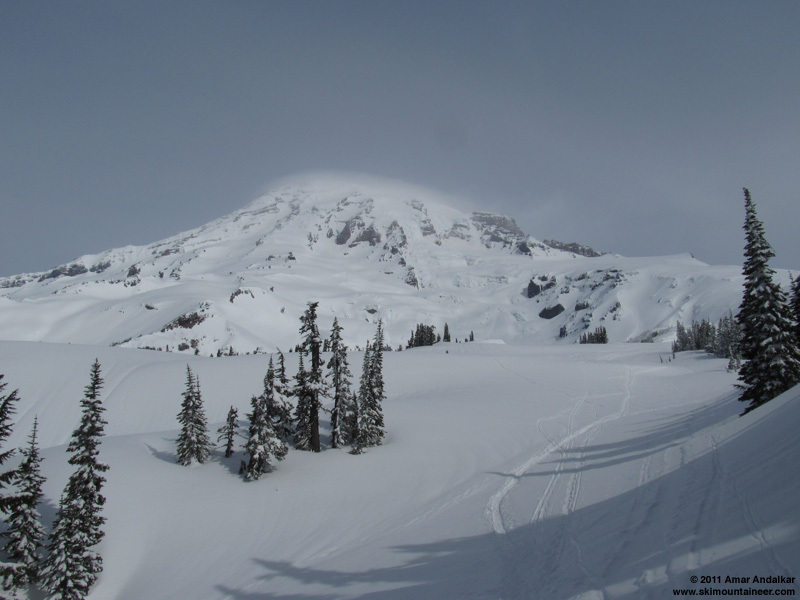 Ski conditions on the Nisqually Glacier were not as good, the several inches of new snow overnight had become sticky in the sun and was not even close to proto-corn yet after only a few hours of sunshine and no melt-freeze cycles. 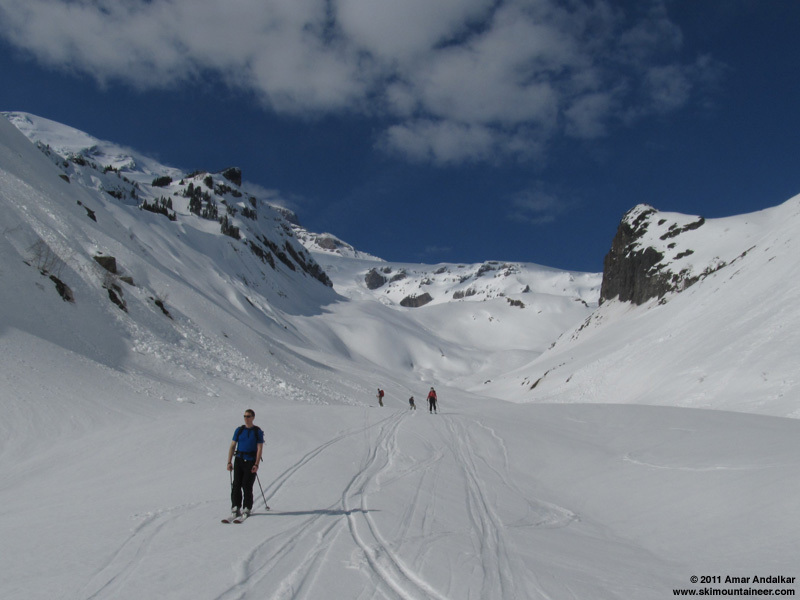 But the ski out was fun nonetheless, the scenery grand as usual in the vast bowl and deep trough of the glacier, such a contrast to the route down Pan Point back to Paradise. Below the glacier's terminus, we followed the RMI guides' tracks down the right side of the Nisqually River and out a slightly ascending traverse through the woods (no skins needed) which arrived right at the lower end of the bridge (3900 ft), just across the road from the parking lot. As we got ready to hitchhike, a party of skiers that we'd met on the way up to Muir drove by us downhill, then stopped, and turned around. They gave Khanh a ride back up to Paradise to get her car, while one of them (Art) waited with me in the sunny parking lot and we enjoyed a nice chat about books and publishing. Thanks guys! 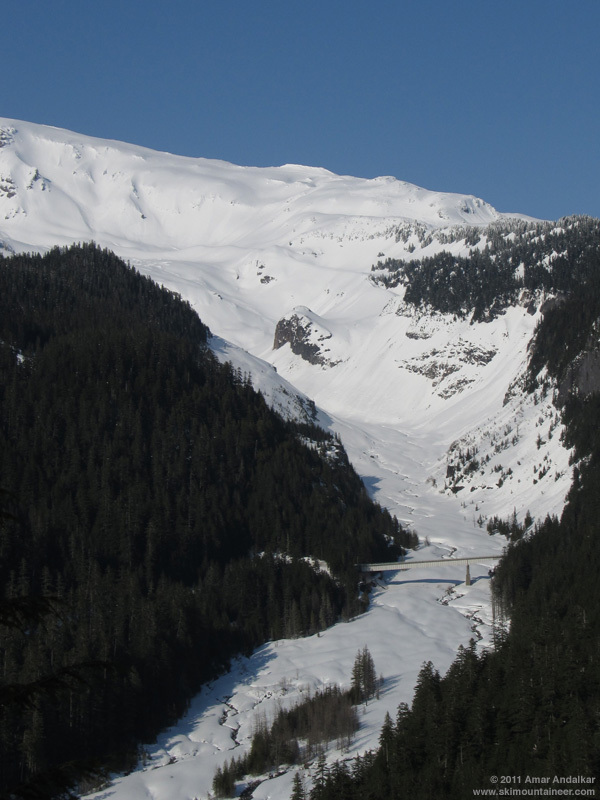 View looking down towards the lower Nisqually Glacier and bridge from near Ricksecker Point. 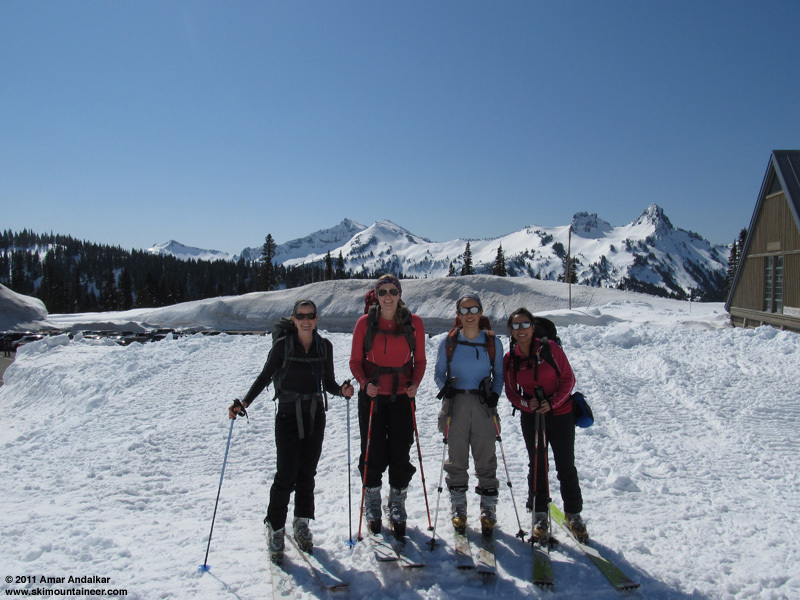 The next morning, three more friends met us in Ashford (Dave and Stephanie Brown, and Candace), and soon we were off to repeat the previous day's fine ski, perhaps with a variation such as skiing the Cowlitz Glacier from Camp Muir instead. Then minutes after parking at Paradise, two more friends (Greg and Randi Blaisdell) pulled into the space beside us. We were now a group of 7, with 3 cars, so it was obvious that we should shuttle one of the cars down to the bridge so we could ski down there without needing to hitchhike. Dave and Greg set off in two of the cars to leave one at the bridge, while I skinned up from Paradise around 10:30am with the four women in the group -- now that's a nice ratio! 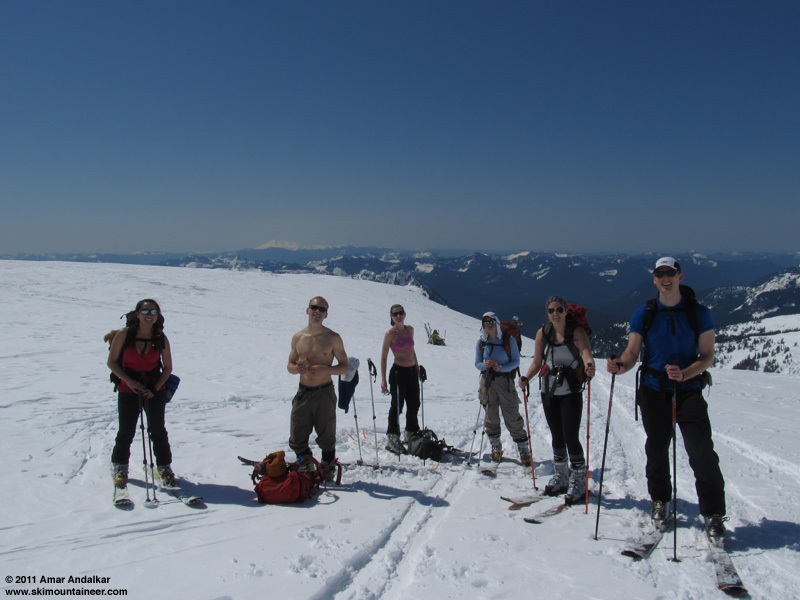 Dave and Greg eventually caught up to us about an hour later while we were skinning up Pan Face, and we continued on as a large group, with some members needing to strip down as the heat and sun grew more intense. Lots more people out today on the weekend than there had been the day before, so the skin track to Muir was a well-worn highway. We reached Muir between 2:30 and 3pm, with an unexpected gusty SW breeze making it quite chilly there once again despite the sunshine. 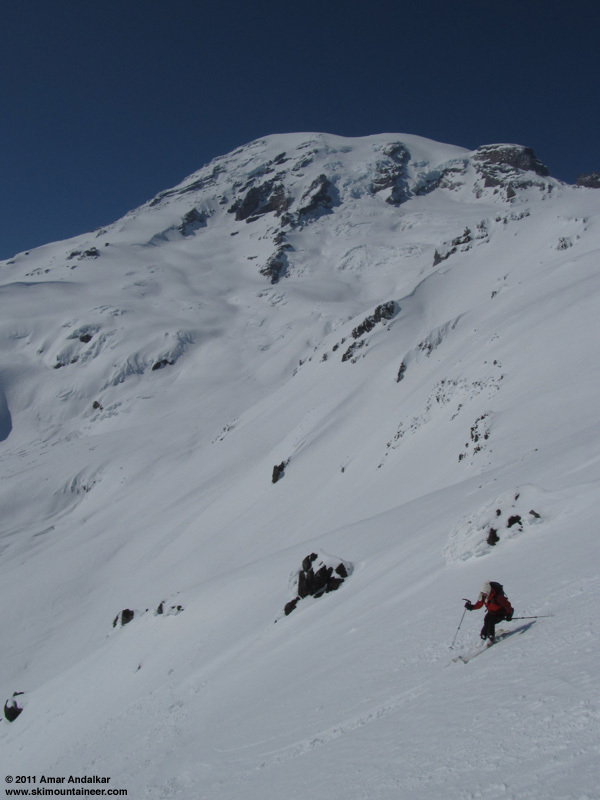 Dave, Greg, and I decided to skin up Cowlitz Cleaver for a bit and ski down AAA Gully from 10400-10500 ft, while the other four switched over at Muir. The ski down AAA Gully was pretty good, still a bit firm, but mostly smooth and predictable. Then once again the snow on the Snowfield was very nice, just as good as the day before and seemingly unaffected by an additional day of intense sunlight. We skied slowly in the large group, leapfrogging and taking lots of photos. 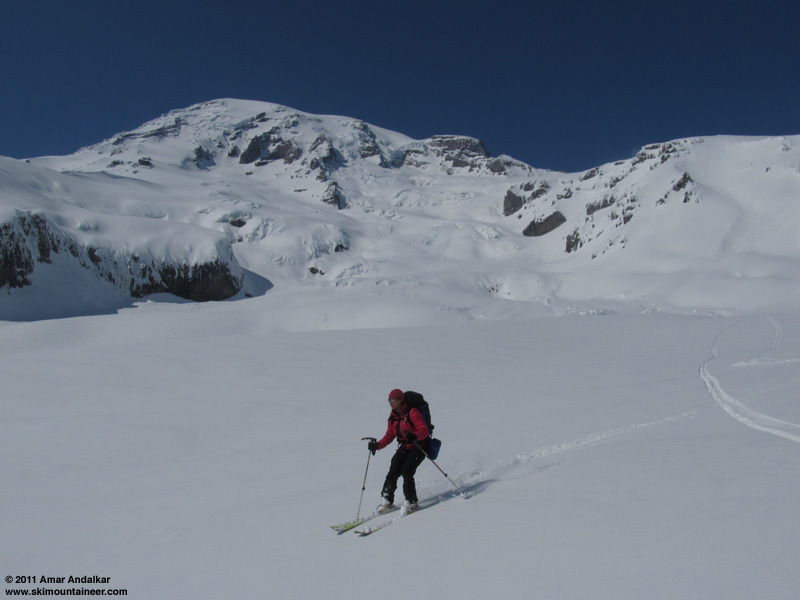 Another scenic run down onto the Nisqually Glacier, with Dave and Greg deciding to ski Nisqually Chute, which turned out to be not as good snow as the Pebble Creek gully which others skied down (almost corn on the lower half). 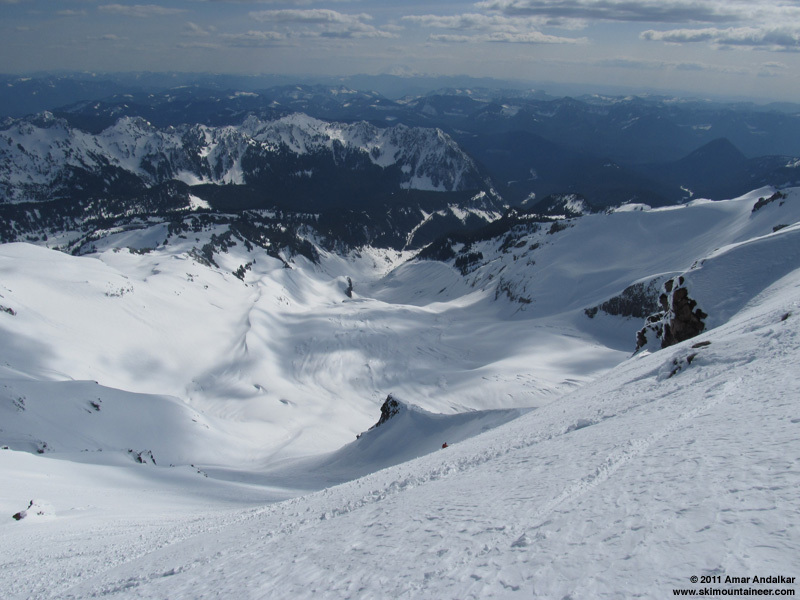 View looking down Nisqually Chute (with Dave barely visible skiing it) towards the lower Nisqually Glacier. 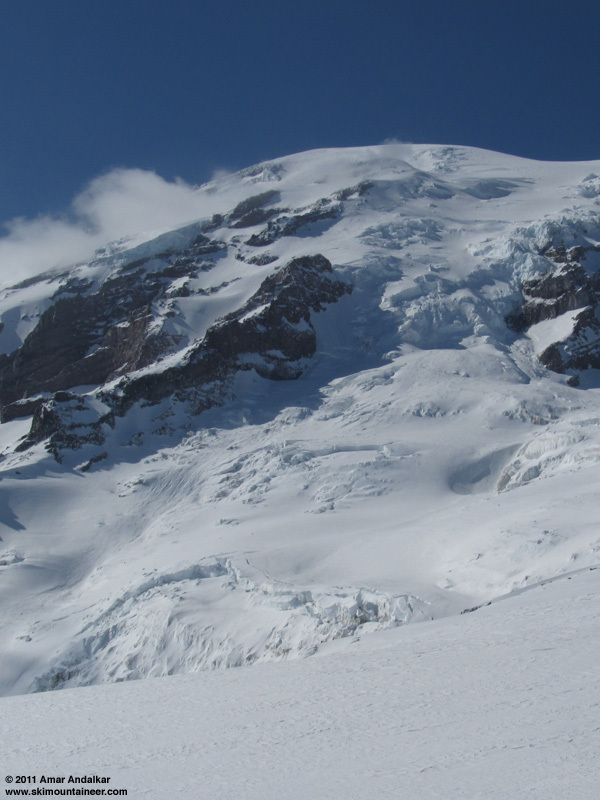 The middle portion of the Nisqually Glacier above 5800 ft is covered in HUGE piles of avy debris, released several days earlier from large crowns near 8500 ft and above -- the full depth of the winter snowpack, about 50 ft deep down to bare glacial ice, appears to have slid from the largest of the crowns. Looking across at the largest of the crowns from near 8500 ft above Nisqually Chute, where the full depth of winter snowpack down to glacial ice appears to have slid. Standing beside the snow-covered piles of avy debris at 6000 ft on Nisqually Glacier. Snow conditions were still very sticky on the glacier, but at least there was little deep mush to be found. We skied out to the bridge by just after 5pm, the first time skiing all the way down there for several in the group. Two glorious days of skiing and sunshine on the Mountain, with great friends providing much-needed company, just what I needed to try to recover some sanity after the latest unfathomable loss. Doubly nice to have the ski-to-climb ratio pegged far above 100%, with a two-day total of 12700 vertical feet of mostly fine skiing for only 9700 feet of ascent on skins. 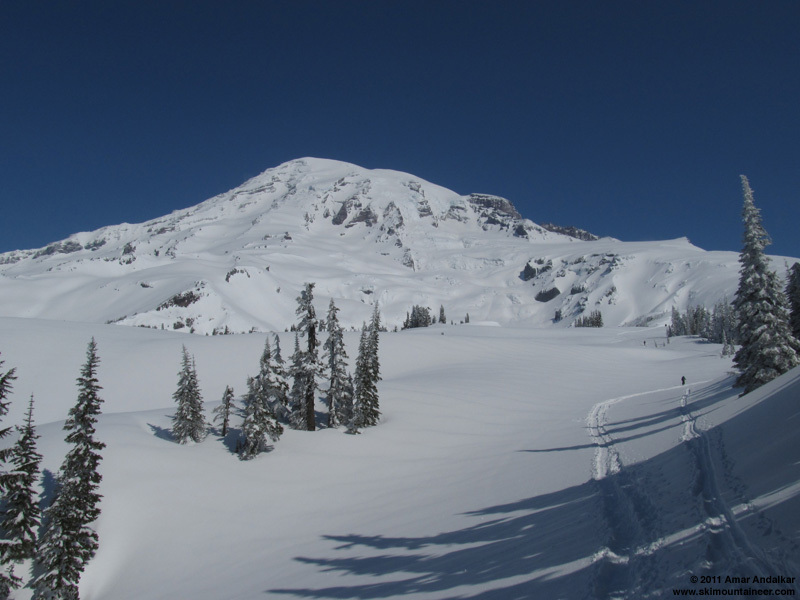 SYNOPSIS...AN UPPER LEVEL RIDGE OFFSHORE WILL BRING MOSTLY SUNNY SKIES TO MOUNT RAINIER NATIONAL PARK TODAY...WITH ANOTHER SUNNY DAY SATURDAY AS THE RIDGE MOVES INLAND. A WEAK FRONT AND ITS UPPER TROUGH WILL PRODUCE SHOWERS SUNDAY...AND MARK A TRANSITION BACK TO A RATHER WET AND COOL PATTERN THAT WILL CONTINUE NEXT WEEK. FRIDAY...SUNNY. FREEZING LEVEL 4500 FEET. FRIDAY NIGHT...MOSTLY CLEAR. FREEZING LEVEL 5500 FEET. SATURDAY...SUNNY. FREEZING LEVEL 5000 FEET. SATURDAY NIGHT...PARTLY CLOUDY IN THE EVENING...THEN MOSTLY CLOUDY WITH A CHANCE OF SHOWERS AFTER MIDNIGHT. SNOW LEVEL 5000 FEET. SUNDAY...SHOWERS LIKELY. SNOW LEVEL 4000 FEET. SUNDAY NIGHT AND MONDAY...SHOWERS LIKELY. SNOW LEVEL 3500 FEET. MONDAY NIGHT THROUGH THURSDAY...MOSTLY CLOUDY WITH A CHANCE OF SHOWERS. SNOW LEVEL 4500 FEET. TEMPERATURE AND WIND FORECASTS FOR SELECTED LOCATIONS.